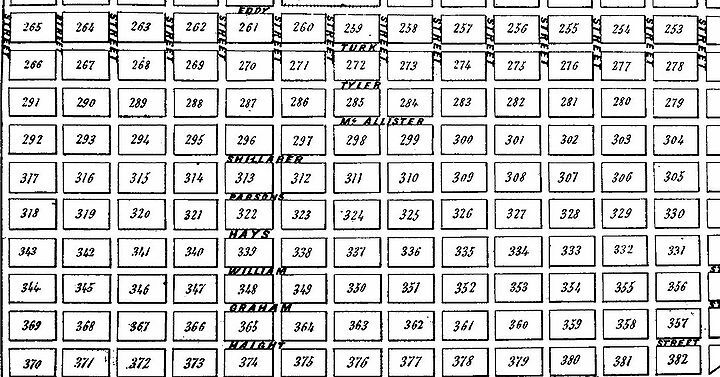 Below is a list of the west-of-Larkin-Street streets from Dexter’s 1851 map along with explanations of the possible origins of the street names and thumbnail biographies of honorees. The original streets are in bold capitals. Today’s corresponding streets are in parentheses. The first three streets were named by Hervey Sparks and the rest by Archibald Peachy, et. al. North/South streets beginning one block west of Larkin Street and progressing westward. From 1854 Bixby/Bridgens Map, note area labeled "Sparks Claim" (north to right). Hervey SPARKS. Born: New York, 1819; died: San Francisco, 1889. Senecca H. MARLETTE. Born: New York; 1824; died: Glendale, California, 1911. This street was the dividing line between Hervey Sparks’ property to the east and Thomas Larkin’s property (and later Peachy, Billings and Wright’s property) to the west. The distance between Division Street and Webster Street was not a full block. West of Division, the full block interval resumes, but because of this Division Street offset, the earlier streets to the west do not align relative to today’s streets. The locations of the earlier streets are described by their mid-block locations relative to today’s streets. North at top of map. 5) LAGUNA STREET (Between Gough and Octavia Streets) There was a lagoon at the northern end of this street. Bethuel PHELPS. Born: Massachusetts, 1820; died: c. 1888. Henry Wager HALLECK. Born: New York, 1815; died: Kentucky, 1872. Dexter Russell WRIGHT. Born: Vermont, 1821; died: Connecticut, 1886. Frederick H. BILLINGS. Born: Vermont, 1883; died: Vermont, 1890. Arrived in San Francisco in 1848 at the age of 25. He formed a law partnership with Archibald Peachy in June, 1849, later to include Henry Halleck. Azro MERRIFIELD. President of Mountain Lake Water Company. Proposed building a water delivery system from Mountain Lake in the Presidio to San Francisco. Archibald Carey PEACHY. Born: Virginia, 1820; died: San Francisco, 1883. Arrived in San Francisco April 1, 1849. Attorney. By May 3, he was practicing law. A month later he had partnered with Frederick Billings to establish Peachy and Billings. In August, 1849, he ran for delegate to the constitutional convention. (He ran against Samuel Haight.) On October 1, 1849 he was appointed city attorney by the city council. He did not run for reelection. His firm specialized in land cases and he owned much of the land west of Larkin Street known as Larkin’s Grant or Rancho Punta de los Lobos. Erasmus Darwin KEYES. Born: Massachusetts, 1810; died: France, 1895. 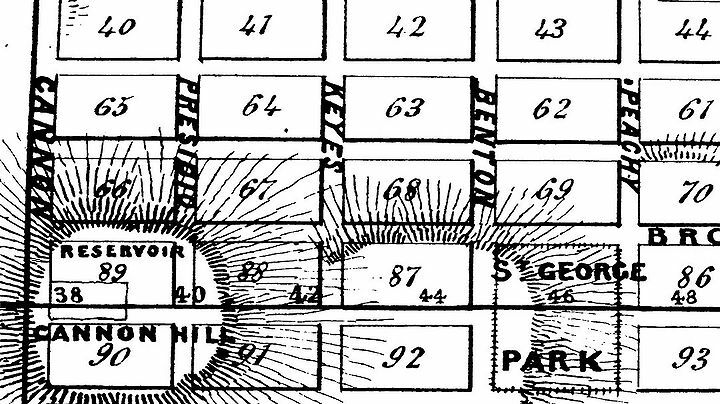 Probable reference to the street’s proximity to the Presidio at its northern end. Refers to Cannon Hill at Pacific Street between Presidio and Cannon Streets. (Today’s Pacific and Lyon Streets.) On April 3, 1850, on the crest of a high hill, Capt. Erasmus Keyes, Henry Halleck (at the time an Army Captain), and Azro Merrifield staked the southeast corner of the Presidio Military Reservation. In May the stake was replaced with a cannon set in the ground. East/West streets beginning one block south of McAllister and progressing southward. Theodore SHILLABER. Born: New York, 1820; died: Germany, 1883. In the late 1840s he traded between Mexico, California and Hawaii. On January 24, 1849 he was proclaimed a “Denizen of Hawaii” by the Kingdom of Hawaii. In 1849 he was an emissary of Hawaiian King Kamehameha to California. He settled in San Francisco sometime in 1849. In 1849-1850 he was involved in the Central/Long Wharf (Commercial Street) project with Erasmus Keyes and others. He was a business partner of Sam Brannan in 1850, and an officer of the San Francisco Chamber of Commerce. Levi S. PARSONS Born: New York, 1822; died New, York 1887. Arrived in 1849. Founded the California Whig Party in February 1850. On March 30, 1850 he was appointed judge by the legislature. One of the first cases he heard was a suit brought by squatters against Capt. Keyes for illegally evicting them from Federal property leased to Theodore Shillaber. Judge Parsons threw the case out of court. John (Jack) Coffee HAYS. Born: Tennessee, 1817; died: Piedmont, Ca., 1883. He arrived in San Francisco January 1850 long after his reputation preceded him. He was a legendary Indian fighter and Texas Ranger Captain. He also fought in Mexican-American War. San Francisco’s first Sheriff 1850-1854. James Sutton GRAHAM. Born: Kentucky, 1824; died: Arkansas, 1862. 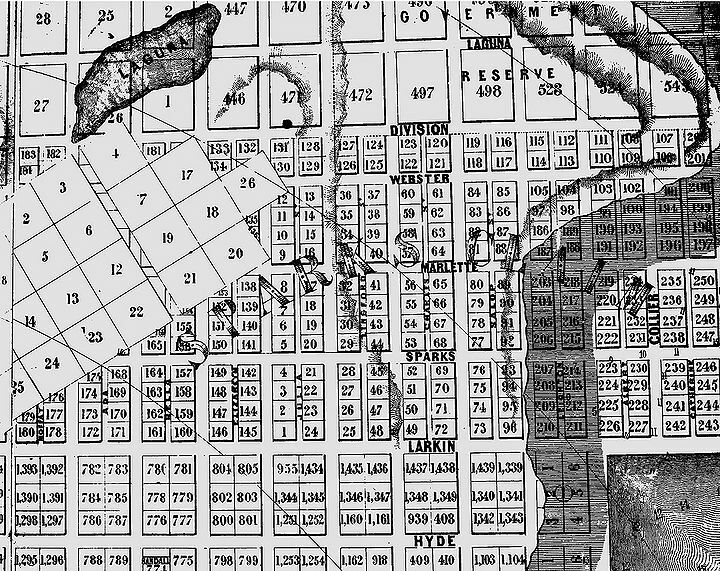 Arrived in San Francisco September 1849. Elected Alderman January 8, 1850 with most votes. He was the owner of the Graham House Hotel, a building prefabricated in Baltimore and shipped to San Francisco on April 19, 1849 by Graham. It arrived September 21 and was assembled on the corner of Kearny and Pacific Streets. H. H. Bancroft described it: “A four-story wooden edifice lined on two sides by continuous balconies. It opened as a first class hotel—The Graham House—on December 25, 1849.” While still an Alderman, Graham sold it to the city for a City Hall on April 2, 1850 for $100,000. The city spent another $50,000 on interior remodeling. Samuel Welles HAIGHT. Born: New York, 1822; died: San Francisco, 1856. Arrived in San Francisco March, 1847, with Stevenson’s Regiment from New York. John MIDDLETON. Born: Pennsylvania, 1811; died San Francisco 1874. Arrived in San Francisco September, 1849. He was one of the leading real estate auctioneers of the day. He was a member of the first Board of Aldermen in June 1850. BEVERLY C. SANDERS. Born: Virginia, 1807; died: New Jersey, 1883. Came to San Francisco in 1850, becoming a commission merchant on the Central Wharf, then became involved in the real estate business with Peach, Billings & Halleck. Did well enough to buy land and a house worth $14,000. Hugh C. MURRAY. Born: Missouri, 1824; died: Sacramento, 1857. Arrived in San Francisco Sept. 15, 1849. Fought in Mexican-American War. Attorney. Elected to Ayuntamiento 01/11/1850.